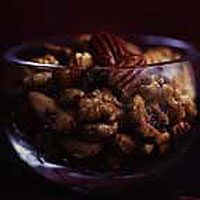 Toss the nuts in a large bowl to combine and spread them out on a baking sheet. Toast in the oven until light golden-brown: 10-15 minutes. Meanwhile, combine the rosemary, cayenne, muscovado sugar, salt and melted butter in a large bowl. Tip the hot nuts into the bowl and toss thoroughly to coat in the spiced butter. Serve warm.